Brooklyn Paper editorial generates outrage; is AY project really "shovel-ready" (as stated in Markowitz's State of the Borough address)? At his State of the Borough Address last night, Brooklyn Borough President Marty Markowitz apparently declared that Atlantic Yards was "shovel-ready," echoing the Empire State Development Corporation. Unanswered is a question Prospect Heights resident Peter Krashes raised Wednesday: would federal stimulus money lessen the burden of the developer or lessen the burden of government? To ensure progress continues on creating the "city center" our borough of over 2.5 million deserves. And let me tell you, if Brooklyn ever needed a project like Atlantic Yards--the time is now. I believe what's most important now -- is the thousands of union jobs it will create right when we need them most! When it comes to ambitious, shovel-ready project, we say "Build Baby Build!" Atlantic Yards -- Yes we can-- and yes we will. Sen. Chuck Schumer, according to Reuters, "said he did not know if the Metropolitan Transportation Authority's Atlantic Yards Brooklyn development would qualify" for federal funds. Well, it's Forest City Ratner's project, and federal money for a new MTA railyard within the project would bail out the developer rather than fulfill a government request already on the table. Noticing New York blogger Michael D.D. 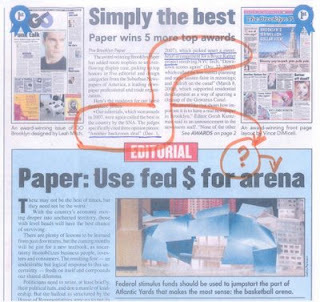 White overkills the Brooklyn Paper's shocker of an Atlantic Yards editorial, and adds his own editorial comment (right) on the newspaper's front page last week. ...But Weintrob does get it partly right. We should be asking for stimulus money for Brooklyn, but not for business as usual — not to benefit well-connected developers at the cost of generating jobs and building desperately needed low- and moderate-income housing and other infrastructure investments that generate well-paying, union jobs that would stimulate the local economy for years to come. They advocate for amending the Atlantic Yards proposal by sub-dividing the MTA’s eight-acre railyard into smaller, developable parcels, a la the UNITY plan. Whether there's a market for that right now is a question, but they say that stimulus funds to relocate the train tracks to enable the development of affordable housing would be a legitimate use of such funds. While some commenters on the Brooklyn Paper web site endorse the editorial, the most extensive comments, including other letters, are critical.